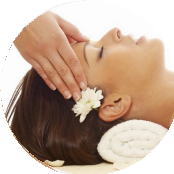 Every one of our highly trained qualified therapists has extensive training, skills and experience. As dedicated healers, all of our therapists care deeply about their work and their clients, taking the time to understand your areas of stress and pain and create a customized massage session to help you relax and feel better. Therefore, each massage on our menu is considered a therapeutic session. We use the term therapeutic to emphasize the fact that our goal is to profoundly affect your physical state, as well as your sense of wellness and health. When you have a massage at Heaven Massage and Wellness Center, were not only trying to make you feel good, but to bring about a positive change in your body. All modalities of massage help your body to return to a more balanced state by increasing the exchange of oxygenated blood and waste products in the cells, which is why circulation is essential to every aspect of cellular health. Increasing oxygenation and lymphatic flow allows cells to flush toxins, heal and recover faster. This results in an increased feeling of vitality, relaxation and energy.